HUAWEI P30 and P30 Pro launched with Kirin 980 processor, Optical SuperZoom Lens and In-Screen Fingerprint sensor. During an exclusive launch event today at the Paris Convention Center, Huawei unveiled the P30 and P30 Pro. These devices feature the innovative HUAWEI SuperSpectrum Sensor, an optical SuperZoom Lens, and a new HUAWEI Time of Flight (ToF) camera. The 6.47-inch HUAWEI P30 Pro and 6.1-inch HUAWEI P30 come in Breathing Crystal, Amber Sunrise, Aurora, Pearl White and Black. The FHD+ (2340 x 1080) Dewdrop Display features a tiny notch, providing maximum display area. The near bezel-less front glass houses an In-Screen Fingerprint sensor for quick and secure identity authentication. The HUAWEI P30 Pro also features HUAWEI Acoustic Display Technology that enables it to deliver high-quality audio through a sound emitting display. The HUAWEI P30 Series is powered by the 7nm Kirin 980 processor, which delivers ultimate performance and faster image recognition through its Dual-NPU AI processing power. The latest EMUI 9.1 also supports HUAWEI Share OneHop for seamless file sharing between Huawei smartphones and Huawei laptops. 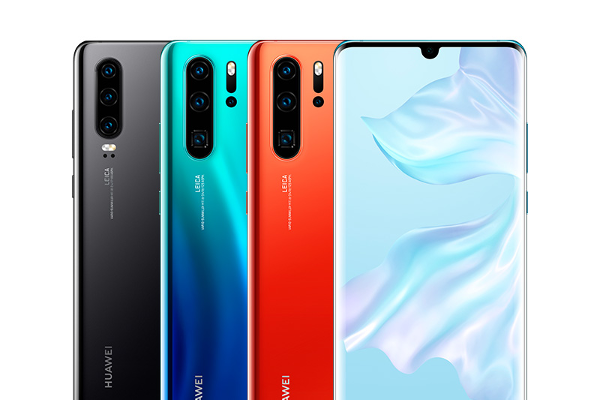 The HUAWEI P30 Pro features HUAWEI SuperCool technology to improve thermal performance, keeping the phone cool even during heavy use. Achieving a record-high overall DxOMark score of 112, the HUAWEI P30 Pro is equipped with a new Leica Quad Camera System, including a 40MP main camera with the HUAWEI SuperSpectrum Sensor, a 20MP ultra-wide angle camera, an 8MP telephoto camera, the HUAWEI ToF Camera and a 32MP front camera that takes selfies. The HUAWEI P30 Series is equipped with a suite of advanced wireless communications capabilities supporting Dual SIM and Dual VoLTE connectivity. The HUAWEI P30 Pro features a 4200mAh battery and 40W HUAWEI SuperCharge that charges a device from zero to 70 percent in 30 minutes. The HUAWEI P30 Pro is also available in a Special Edition Gift Box. This premium set includes a Breathing Crystal or Pearl White HUAWEI P30 Pro and a Pearl Pink Glamorous Case encrusted with Swarovski crystals. Price will be announced at the time of the launch.